I finished them! The same day as my last post I grafted the two toes and then danced around the house for a while. I am in love with these socks. The pattern is a finicky one and I didn’t ever truly commit it to memory, but such is the way of twisty-turny travelling twisted rib. It is very clever though. I utterly love the little go-faster chevrons, and the flung-out mirroring wings over the heels. 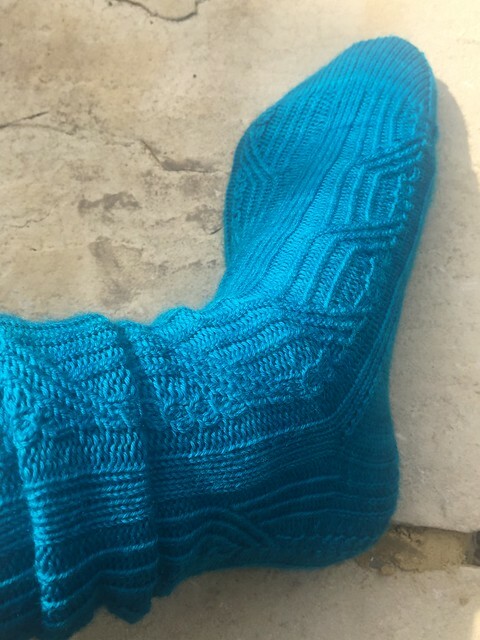 Clever old Rachel Coopey with yet another sock pattern masterpiece. And the yarn from Easyknits is soft and maybe it’s a risk, but I’ve knitted these up on 2mm needles so the fabric is dense, and I tend to be pretty careful with my handknits. I’ll take good care of them. The colour alone makes the risk worthwhile. I chased the sun all over the house trying to capture the actual shade of intense turquoise blue/green of this yarn – and then went outside to see if that would help instead. It didn’t. 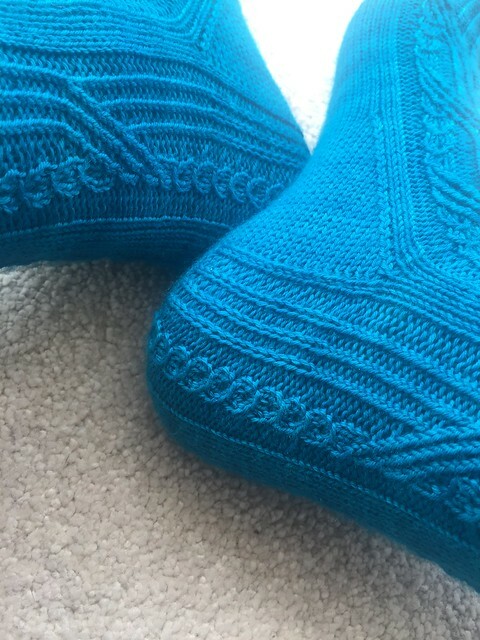 I’ve followed the pattern exactly as written, except for knitting the medium size on smaller needles as per my Linnea socks. 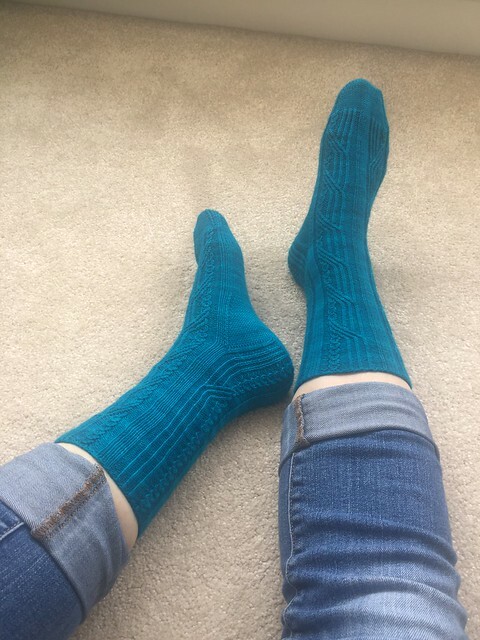 And also doing an extra pattern repeat on the leg (another 24 rows) – I knew I had plenty of yarn and I was reluctant to have too much left over. There’s about 30g still to go, though, which I shall stash away for a bright splash in a pair of gloves at some point (I am thinking maybe these, one days, which are delightfully ridiculous). I have ever so slightly lost my knitting mojo, this month, and I think it is a combination of finding the Voyager Stole a little (shh) boring, while being distracted by home improvements (redecorating our hallway). I might treat you to that on another post, though. 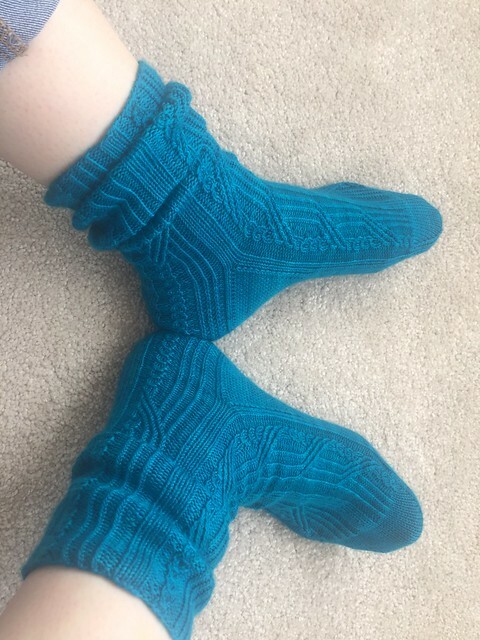 In the meantime I am getting going on my next sock jaunt (must have something to post on my next sock-along post on Thur!). Tiny spoiler: it’s something very orange. What a splendid finish! 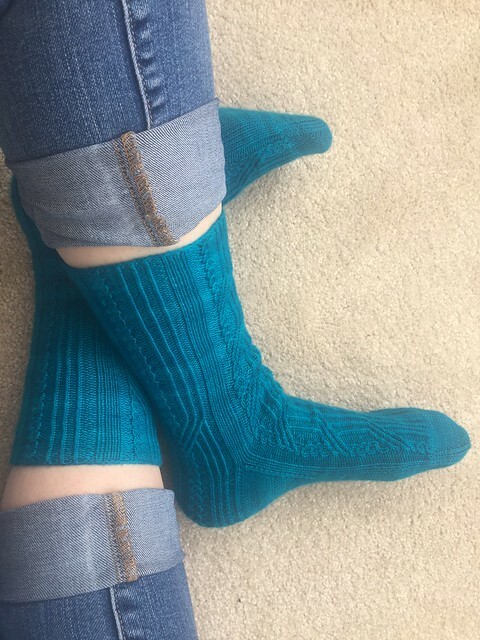 The stitch pattern shows up strong and the color you chose is pretty. These are absolutely gorgeous! I love the pattern and all the intricacies. I can see how it might be hard to memorize; however I’m sure it kept you on your toes!